You’ve thrown a Frisbee haven’t you? Then you have all the skills necessary to play disc golf. Instead of throwing your disc to a friend (or your dog) to catch, you throw at a target. It’s that simple. But first, a little history. 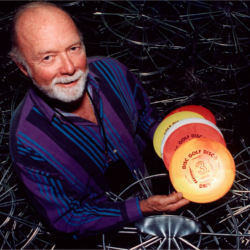 Back in the 60s, Ed Headrick was working at Wam-O Toys and invented the Frisbee. The disc was a huge hit. By the mid-70s, there were Frisbee freestyle tournaments popping up all over. Some devoted players played an early version of disc golf with drinking fountains, garbage cans, and light poles becoming the “golf holes.” Ed recognized the potential for an organized competitive game and developed the first Disc Golf Course in 1974. Initially the “holes” were simply poles cemented into the ground. In 1976, Ed designed a Disc Pole Hole with a basket and construction of chains to stop and catch the disc. (No more arguments about whether the target had been hit or not!) A version of that first Disc Pole Hole is still used. The sport has grown over the years. The Disc Golf Association was established in 1976 by Headrick and today there are more than 4000 registered courses around the world. 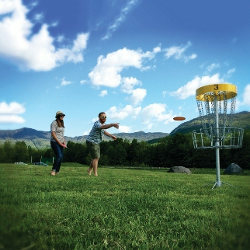 Here in Vermont, there are over 40 courses including at Magic Mountain and Smugglers’ Notch Resort as well as a number of scheduled tournaments including the 2018 PDGA Professional Disc Golf World Championships at Smugglers’ Notch Resort from September 2-9, 2018. Still not convinced? 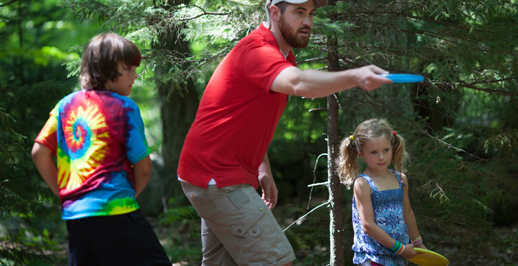 Check out some of the video on the Professional Disc Golf Association site. Pick up some pointers and head to the nearest course to try them out.